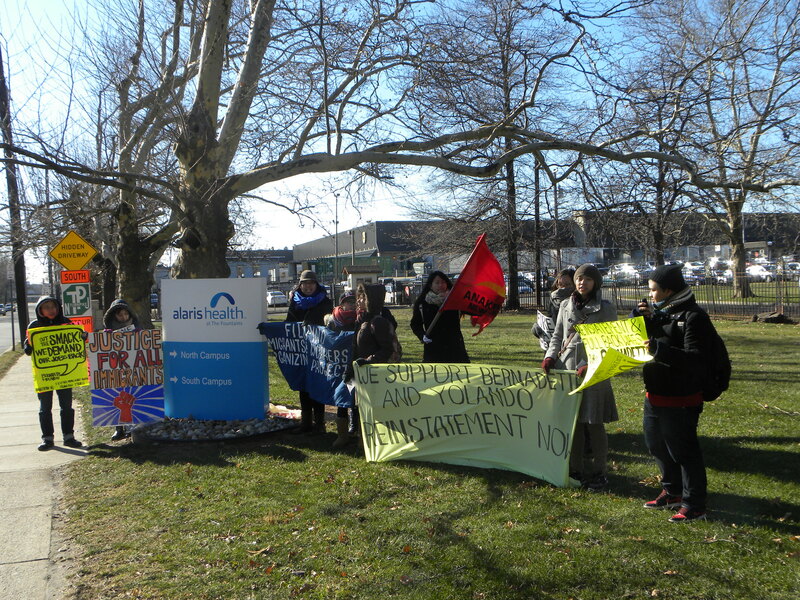 Secaucus, NJ – Filipino activists and community advocates rallied at Alaris Health at the Fountains- South Campus early Tuesday morning to demand full back wages and job reinstatement for two Filipino workers. Bernadette De Leon and Yolando Simon, both dietary aides, were unjustly suspended on May 29, 2014, and eventually terminated on July 10, 2014. The rally was held coinciding with the arbitration hearing between 1199J, who are representing the workers, versus Alaris Health. The two Filipino workers were terminated by Patricia Meyers, Administrator at Alaris Health at the Fountains – South Campus for allegedly stealing frozen goods. These were denied by De Leon and Simon. The two workers said that they were not afforded the opportunity to tell their side and were not provided due process. Both workers were reliable, long-term employees of Alaris Health, who consistently received certificates of recognition. “We are here to show support for Bernadette and Yolando who are fighting against their unjust termination. We are here to show that the community is on the side of workers rights.” said Hanalei Ramos, an organizer with the Filipino Immigrants and Workers Organizing Project. The protest culminated with the advocates delivering a letter to Pat Meyers, Administrator of the Alaris site. The delivered letter was also signed by a number of local community organizations, demanding that Meyers be held accountable for her conduct. “As a Filipino youth organization, we stand with Bernadette and Yolando. We demand that Patricia Meyers be held accountable for the blatant discrimination and unprofessionalism that occurred under her watch,” said Nina Macapinlac of Anakbayan New Jersey. “Workers’ rights are always under threat by employers who seek to exploit their workers. It is therefore important that workers be always vigilant and ready to assert their rights,” Macapinlac concluded. ABNJ Wishes a Liberating 2015 to All! Thank you for your support. Please Donate Today! As we look back on 2014, Anakbayan NJ is humbled and awed by the ongoing support and love of our families, friends, supporters and allies. Thank you all so much for your belief and commitment to our work! This past year was a big transitioning stage for our chapter, and we welcome the new year as a strong and growing group of Filipino youth and students. In these early days of 2015, we look back on our accomplishments and reflect on lessons learned. Initiated Taskforce Haiyan NJ to sustain fundraising for the Philippines in the aftermath of Typhoon Haiyan, and to educate the community about the political problems underlying the natural disaster. Successfully pushed for the passage of a Jersey City council resolution in support of Temporary Protected Status, which would grant immigration relief to Filipinos here in the US. Sent two delegates on a relief and rebuilding mission trip to the Philippines with Kapit Bisig Kabataan Network in response to the devastation of Typhoon Haiyan. Confronted Pres. Noynoy Aquino in a militant action at Columbia University, exposing his failures to the Filipino people, especially Typhoon Haiyan survivors and the peasant farmers on the Cojuangco-owned Hacienda Luisita. Led the labor case of two Filipino nursing home workers who were unjustly terminated from their jobs by providing access to legal resources and gathering community support. Took an active role in the formation of new local alliances and organizations, namely the New Jersey Youth for Immigrant Liberation and the Filipino Immigrant and Workers Organizing Project. Celebrated 9 years of organizing and elected a new Executive Committee! Education as a Human Right – As part of a national Anakbayan USA campaign, we will be launching a local campaign against student debt to fight for the right of all youth to an education. Filipino Workers Case — We hope to turn the case of the two Filipino nursing home workers into a full-fledged campaign to finally help them secure justice and raise awareness on the conditions of Filipino migrant workers here in the United States. Help for the Philippines – Organize for another solidarity & relief mission to the Philippines in the summer and send delegates to an additional exposure trip in November for the International League of People’s Struggle Conference. Focus on building a strong base of Filipino youth and student leaders in Jersey City to fight and address the needs of the local community. As a movement upholding the principle of self-reliance, members and supporters are the source of our organization’s funds and resources. Please consider making a donation to Anakbayan-NJ ($5, $10, $25, $100+ ) so that we can continue serving the people in the new year. We hope to accomplish a goal of $500 by the end of January 2015! 1. VENMO- Sign up for a Venmo account (it’s FREE). Send the amount you can to “Anakbayan NJ”, or anakbayannj@gmail.com using the application for your computer, iPhone, or Android device. 2. PAYPAL– If you prefer not to make a Venmo account but would like to donate online, you can send your donation to the PayPal link below. This is connected to our Vice Chairperson’s account who will confirm receipt of your payment shortly after. 3. CASH/ CHECK- pay to the order of “CASH”, write “ANAKBAYAN NJ” on the memo, and mail to Anakbayan NJ, c/o Social Justice House, 125 Glenwood Avenue, Jersey City, NJ 07306, or email anakbayannj@gmail.com with “2015 Donation” on the subject line to arrange pick up from one of our executive committee members. JOIN A RELIEF MISSION TO THE PHILIPPINES- Anakbayan NJ is a member of Kapit Bisig Kabataan Network, a national Filipino American youth and student-led relief network built in response to Typhoon Haiyan and future disasters. Sign up here by January 12, 2015. Your donation and support will help us continue fighting for justice and genuine democracy both here in New Jersey and back home in the Philippines! Salamat and we wish you all a happy new year! 2014 Year In Review: Lumalakas! Lumalawak! Lumalaban! 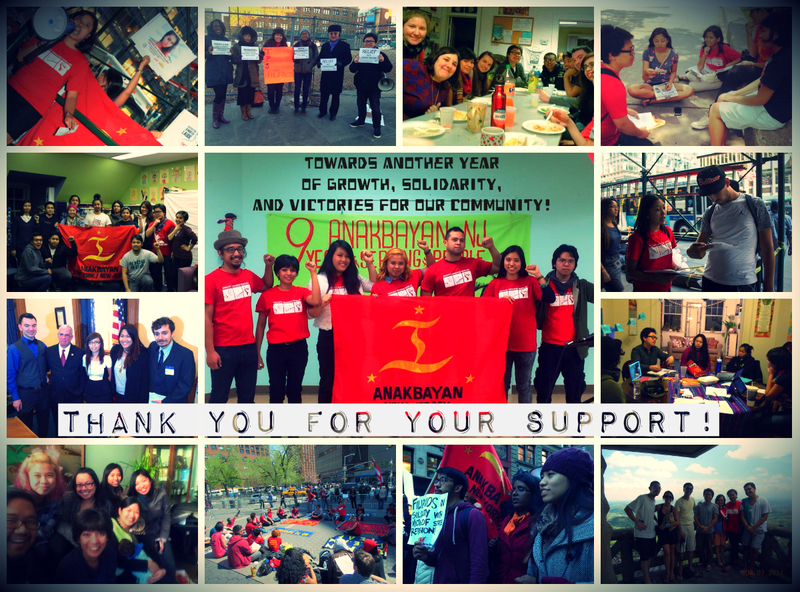 Thank you for supporting Anakbayan-USA in another empowering year of serving the people. Let us wrap up the 2014 by going through the highlights of this year. Early this year, we saw the growing unity among Filipino-American youth and students with the formation of Kapit Bisig Kabataan Network, a national network of Filipino-American youth and students in response to the devastation of typhoon Haiyan. In March, we were able to launch coordinated actions to condemn the murder of Freddie Ligiw, a member of Anakbayan Abra, and his family by the fascist Armed Forces of the Philippines. Anakbayan chapters across the country scrambled to organize indignation protests. We were able to highlight the ongoing human rights violations and the need to cut US military aid to the Philippines. In June, we held our first ever national training with the goal of further strengthening our capacity to organize and wage campaigns. This was due to demand from our organizers on the ground and also a necessity as we prepare to contribute in a big way to the advancement of the National Democratic movement. 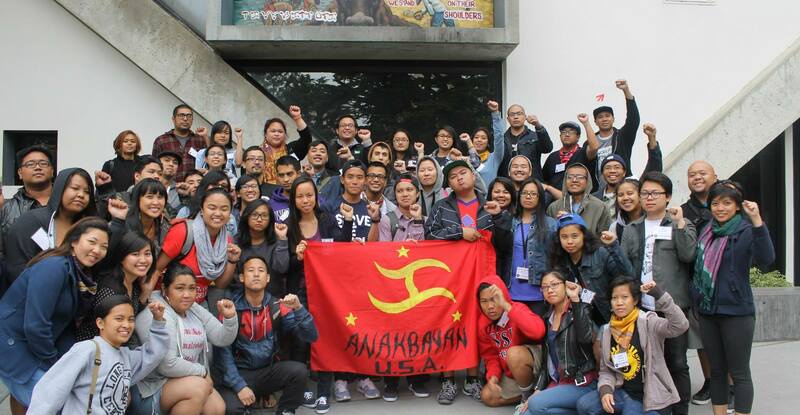 Around 100 Filipino youth and student activists from across the country convened in San Francisco State University on a two-day training and sharing of best strategies and experiences. The workshops ranged from conducting social investigation, solid mass organizing, grassroots fundraising to waging mass campaigns. We also discussed the effects of neo-liberalism on education and the growing problem of student debt. This summer, our chapters have helped in a big way in the holding of the first youth and student-led relief and rebuilding mission under the banner of Kapit Bisig Kabataan Network. 24 participants joined from Pacific Northwest, Northern California, Southern California, Mid West and East Coast. 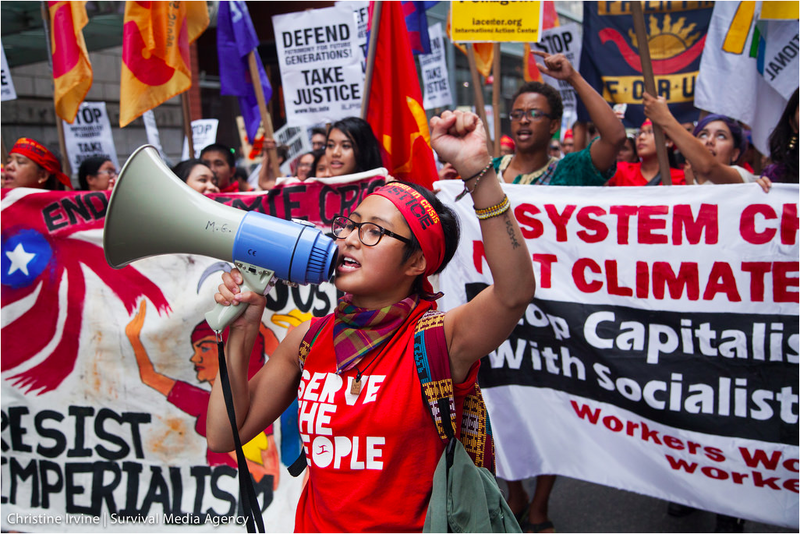 In September, our members have participated in the People’s Climate March, biggest climate action held in New York City to demand system change not climate change. We helped unite and mobilize various Filipino organizations to take a stand. Also in September we have made the headlines by confronting BS Aquino at his speaking engagement at Columbia University. We have exposed the corruption of Typhoon Haiyan donations, the ongoing struggle of farmers in Hacienda Luisita and the continued policy of repression and killing of activists. In November, we have helped organize a national week of action to commemorate the first year of Typhoon Haiyan with Kapit Bisig Kabataan Network. We also celebrated the 50th anniversary of Kabataang Makabayan. Cultural performances and discussions were held across the country to study and uphold the legacy and revolutionary vision of Kabataang Makabayan. This year we have seen the strengthening of established chapters and the creation of new ones. We have seen the rise of new leaders in all our chapters but notable are the elections of new Executive Committees of New York, New Jersey and Silicon Valley chapters. We have also established new chapters in the Inland Empire and Long Beach, California. 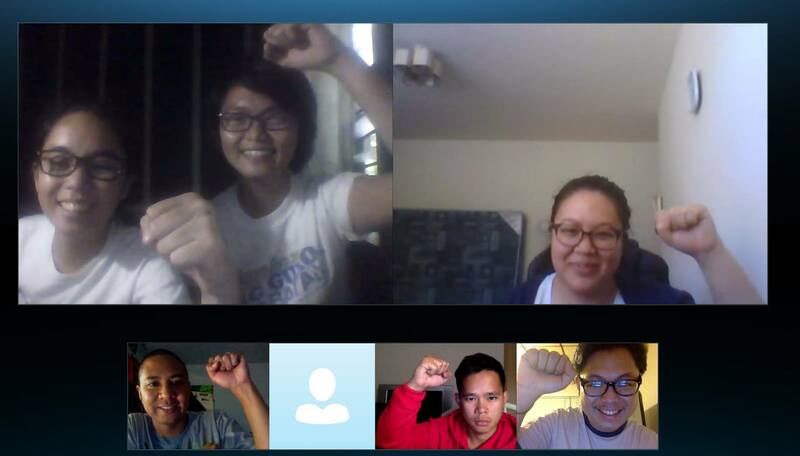 As an international movement, we also have to mention that this year we were able to convene the leaders of Anakbayan chapters from United States, Canada, the Netherlands, Australia and the Philippines to strengthen coordination and share experiences and best practices. In recognition of our internationalist duty and the need to build cooperation and unity with other youth and students and people’s organizations, we have advanced our solidarity work. We have sent delegates to United We Dream’s congress in Arizona last February. We have also sent a delegate to the United States Student Association congress in California. We’ve sent delegates to the National Students for Justice in Palestine Conference in Massachusetts and have linked arms with youth and students in various mobilizations on various issues: in defense of refugee migrant children and in solidarity with the Black Lives Matter movement. We have also established communications with the National Students for Justice in Palestine, Movimiento Estudiantil Chican@ de Aztlán (MECHA), Students for a Democratic Society (SDS) and many more. We have also seen the growing militancy of actions in confronting the enemies of our people. We’ve used sit-ins, mud-stenciling and lightning rallies to expose BS Aquino and uplift the voices of our people back home. There are lots of challenges to overcome, lessons to be learned and work to be done. We are ever more committed to advancing our people’s struggle for liberation and democracy. Onwards to 2015! Onwards to more victories!